In the search for the mysterious dark matter, physicists have used elaborate computer calculations to come up with an outline of the particles of this unknown form of matter. To do this, the scientists extended the successful Standard Model of particle physics which allowed them, among other things, to predict the mass of so-called axions, promising candidates for dark matter. The German-Hungarian team of researchers led by Professor Zoltán Fodor of the University of Wuppertal, Eötvös University in Budapest and Forschungszentrum Jülich carried out its calculations on Jülich&apos;s supercomputer JUQUEEN (BlueGene/Q) and presents its results in the journal Nature. “Dark matter is an invisible form of matter which until now has only revealed itself through its gravitational effects. What it consists of remains a complete mystery,” explains co-author Dr Andreas Ringwald, who is based at DESY and who proposed the current research. Evidence for the existence of this form of matter comes, among other things, from the astrophysical observation of galaxies, which rotate far too rapidly to be held together only by the gravitational pull of the visible matter. 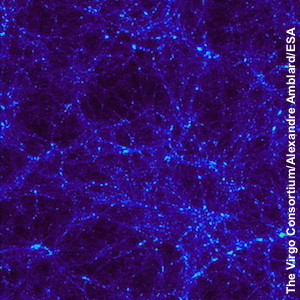 High-precision measurements using the European satellite “Planck” show that almost 85 percent of the entire mass of the universe consists of dark matter. All the stars, planets, nebulae and other objects in space that are made of conventional matter account for no more than 15 percent of the mass of the universe. “The adjective ‘dark’ does not simply mean that it does not emit visible light,” says Ringwald. “It does not appear to give off any other wavelengths either – its interaction with photons must be very weak indeed.” For decades, physicists have been searching for particles of this new type of matter. What is clear is that these particles must lie beyond the Standard Model of particle physics, and while that model is extremely successful, it currently only describes the conventional 15 percent of all matter in the cosmos. From theoretically possible extensions to the Standard Model physicists not only expect a deeper understanding of the universe, but also concrete clues in what energy range it is particularly worthwhile looking for dark-matter candidates. The existence of axions is predicted by an extension to quantum chromodynamics (QCD), the quantum theory that governs the strong interaction, responsible for the nuclear force. The strong interaction is one of the four fundamental forces of nature alongside gravitation, electromagnetism and the weak nuclear force, which is responsible for radioactivity. “Theoretical considerations indicate that there are so-called topological quantum fluctuations in quantum chromodynamics, which ought to result in an observable violation of time reversal symmetry,” explains Ringwald. This means that certain processes should differ depending on whether they are running forwards or backwards. However, no experiment has so far managed to demonstrate this effect. The extension to quantum chromodynamics (QCD) restores the invariance of time reversals, but at the same time it predicts the existence of a very weakly interacting particle, the axion, whose properties, in particular its mass, depend on the strength of the topological quantum fluctuations. However, it takes modern supercomputers like Jülich&apos;s JUQUEEN to calculate the latter in the temperature range that is relevant in predicting the relative contribution of axions to the matter making up the universe. “On top of this, we had to develop new methods of analysis in order to achieve the required temperature range,” notes Fodor who led the research. The results show, among other things, that if axions do make up the bulk of dark matter, they should have a mass of 50 to 1500 micro-electronvolts, expressed in the customary units of particle physics, and thus be up to ten billion times lighter than electrons. This would require every cubic centimetre of the universe to contain on average ten million such ultra-lightweight particles. Dark matter is not spread out evenly in the universe, however, but forms clumps and branches of a weblike network. Because of this, our local region of the Milky Way should contain about one trillion axions per cubic centimetre. Thanks to the Jülich supercomputer, the calculations now provide physicists with a concrete range in which their search for axions is likely to be most promising. “The results we are presenting will probably lead to a race to discover these particles,” says Fodor. Their discovery would not only solve the problem of dark matter in the universe, but at the same time answer the question why the strong interaction is so surprisingly symmetrical with respect to time reversal. The scientists expect that it will be possible within the next few years to either confirm or rule out the existence of axions experimentally. The Institute for Nuclear Research of the Hungarian Academy of Sciences in Debrecen, the Lendület Lattice Gauge Theory Research Group at the Eötvös University, the University of Zaragoza in Spain, and the Max Planck Institute for Physics in Munich were also involved in the research.